Does this ring true to you - personality types? Do these 4 types resonate with your experience? Should a person’s ‘type’ disappear at conversion? Or should we be aware of our personal type, it’s strength and weakness? Is it just natural that different types will gather different perspectives from the same teaching? How much of our head-butting on the Forum could be avoided by understanding these things? You’re taking me back to Tim La Haye? I don’t know about these particular categories, but I do know there are many similar personality types advocated. My kids have especially been into the 9 Enneagram types as well as the Meyers-Briggs personality types, and the Taylor-Johnson personality inventory. One may debate what labels apply to who, but I have no doubt that we vary as to how our personalities are bent and which motivations tend to drive us. Most theories agree that each type had its’ strengths and its vulnerabilities, and I think these insights can help us better understand and appreciate ourselves as well as others. Believe it or not, I don’t know who Tim LaHaye is!! Time to Google! Yes, His “Spirt-Controlled Temperament” outlined the four types, “Sanguine, Choleric, Melancholy, or Phlegmatic,” and was my first introduction to personality theories, I think back in the 60’s. Tim LaHaye’s is a good book. It kind of helps you to psycho-analyse yourself. I sort of figured out I am a sanguine fellow, might also be a bit phlegmatic with a dash of choleric and a sprinkling of melancholy on the side. This thread has gotten me to think, in a new direction. 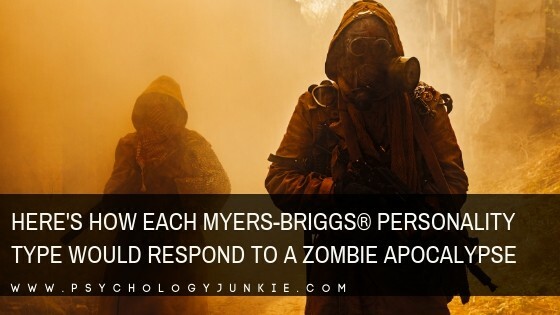 What Myers Briggs personality types would survive a zombie apocalypse? Despite my personality type, or because of it, I simply skimmed your initial post, Dave. Sorry about that, but don’t blame me, blame my type. However, I now notice you asked specific questions which I will try to answer truthfully, in the order you posed them. Q1. If you are asking if I am aware of my personality type, yes, I am all too sadly aware of my weaknesses. Q2 (a) No, I see no need for that, plus it is probably an impossibility. (b) It can only be a good thing to be aware of my strengths and my weaknesses (should I have any of the latter). Q4. That is maybe a subjective question. I can see myself as appearing to others as being predominantly a sanguine/phlegmatic individual who occasionally, to a greater or lesser degree, exhibits flashes of the melancholic / choleric side of me. Norm, Norm - that is truly a sad statement. It doesn’t hurt my ego, which I shed long ago in order to ascend spiritually by releasing myself from astral determinism and passing through the planetary zones…well enough of that. I’m thinking only of your welfare - follow the example of the rest of the folks here who hang on my every word as the foundation of their happiness. I am a mixture of 3 and 4. I think they are good starting point.